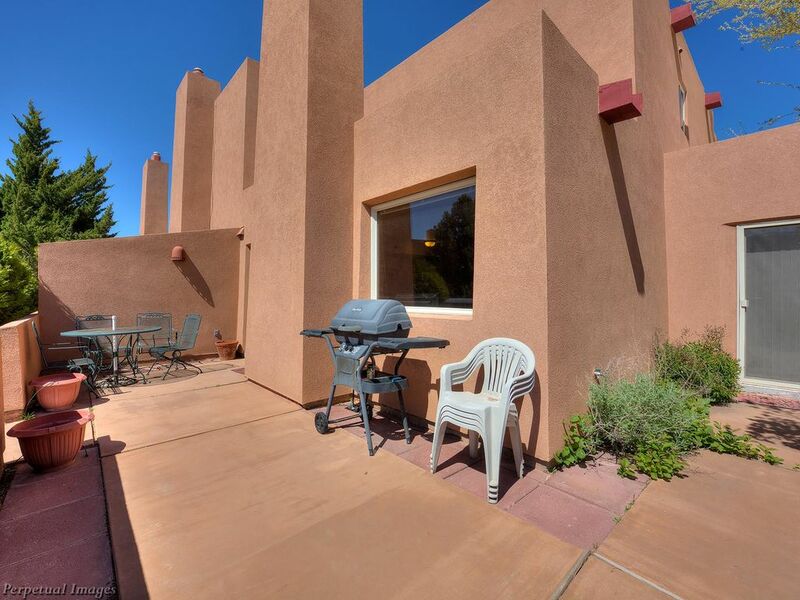 Tastefully decorated with amazing red rock & golf course views! This condo has unobstructed Moab Rim Views as well as views of the beautiful Moab golf course. It has been customized and will provide all the comforts of home! You can enjoy fantastic unobstructed sunset views from the patio area, where you can grill your meal. The property is ideally located near the lovely swimming pool area. With a single car garage, you have a safe place to lock up your bikes or other equipment. The location is perfect. Away from hustle and bustle, but still very convenient located to Moab and Parks. Quiet well appointed condo that was clean and had everything needed. I&#x2019;d definitely stay again! Very comfortable, in good condition. The kids loved the "extended" backyard that shared a border with the golf course for running around in the early evenings. We had a great stay. We stayed in Moab for 5 days with our 2 teenage boys. Great experience! Clean and cute little southwest vibe to the home. and an AMAZING view. Worth every penny. Definitely will be going back! There is so much to do in Moab, you could come back annually and never do it all! Moab is a Mountain Biking Mecca with an amazing trail system that spans hundreds of miles. You'll find everything you need to ride the trails whether it's a bike rental or a shuttle for you and your friends that will drop you off where you need to go. There are also Outfitters who will gladly take you into the back country and facilitate a safe and exciting experience! The world famous Slickrock trail is a Must-do but don't take it lightly! It's a challenging and adventurous ride. There are a multitude of excellent books written on the subject and we highly recommend finding one that suits your style. Pay particular attention to the parts that talk about the peculiarity of biking in the desert. You're coming to play, not get into a compromised situation which adds up to trouble! If Hiking is more to your liking, you've come to the right place. Like the extensive biking trails, Moab/Grand County boasts awe-inspiring hiking trails for the beginner up to advanced. There are trails that are more well-suited to families with children as well as pet-friendly hiking trails criss-crossing the stunning landscape. Make sure to follow the prudent actions of locals which is always take 3 times as much water as you think you'll need and Always tell somebody where you're going and when to expect you to return. It's unfortunately not unusual for visitors to get lost and thus require Search & Rescue. Make sure that's not you! Needless to say, Rock Climbing has become a widespread activity in the Moab area. It makes sense when you look around you and notice that all you see are.... Rocks! There are a lot of online resources that will guide you to the best spots and get you prepared for climbing in the desert. Again, 3 times as much water as you need is always a good rule of thumb. If you yearn to be in the water, you have many options which includes the mighty Colorado River. On the river, you can raft, tube or kayak your way down. Just remember, ALWAYS wear a life jacket when you go in the Colorado. There are eddies and undertows all along the river and those who are foolish enough to go in without a life jacket almost always end up in trouble. Moab has several Outfitters who happily take visitors on 1/2 day, full-day and multiple night river trips. There are a lot of white water rapids to satisfy the most avid adrenalin junkie! The river is always where you want to be in the heat of the blazing summers! There are also some lakes in the La Sal mountains, a short drive away. These smaller bodies of water provide great fishing and general splash value in the summertime. One of the more popular pastimes in Moab is Sight-seeing. Grand County is home to 2 National Parks as well as a State Park. There are many great out & back day road trips, whether you choose to drive down into Canyonlands National Park or take the loop that includes Dead Horse Point State Park. A good tip is to always keep your vehicle topped off with gas and, as usual, take a lot of water should you find yourself in a compromised situation. You also may be the one person that can help somebody in trouble and without water. Remember: you're literally in canyons so don't expect to have the best cell phone reception. In fact, you'll find yourself without service a lot if you get out & explore. If you find a good tour book, you can see all kinds of petroglyphs & pictographs that were left by the Native americans who occupied this valley. As a Moab Local, we request that you please leave our fragile area as you found it or better. It is easy for the beautiful landscape to be destroyed by thoughtless visitors. Also, please do not remove any rocks or historical markers. Leave things the way you found them! Moab is a great little city with a hometown feel. We have access to great restaurants, an extension university, festivals and all the activities mentioned above among a thousand other amenities. Come visit us in Moab. You'll find yourself coming back time & again! Other activities available: Zip Line, Horseback Riding, Fishing, Petroglyphs, Arches National Park, Canyonlands National Park, Bouldering, Climbing, Hot Air Balloons, Exploring, Sky-diving..
One time cleaning fee of $75 applies to each rental. There is a 2 night minimum on all stays.